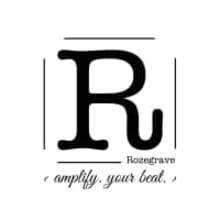 Rozegrave was born in the fall of 2015, when brothers Taylor and Davis Graves wanted to simplify and maximize cajon performances. We had been using traditional cajons as an integral part of our live and recorded performances, but when we integrated live looping into our gigs, we found traditional box drums to be lacking live loop friendly compatibility. It was at this point the idea to create a compact, amplifiable, and completely "looping compatible" cajon was born. We needed it small and lightweight, and the electronics and response to amplification would be paramount in it's design. Ever evolving in sophistication and complexity, the current Rozegrave line serves to capture the needs of live and studio performers with our unique concepts and applications. Our custom cajons and foot stomps continue to push the line of cajon usability, appealing to the mobile musician looking to expand and express their sound and space with ultimately original amplifiable percussion. Whether you're a solo performer kicking out a bass drum groove with your foot, a solo artist or small band running an organic drum into a looping pedal for a percussive backing, a drummer in a gigging band touring the country with an act by plane, or creating original beats in the studio, you'll find your unique drum gear here at Rozegrave.